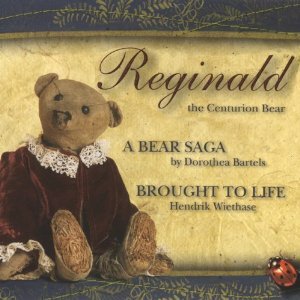 Reginald, the Centurion Bear was brought into this world in 1905 by M. Steiff in Giengen, Germany. Thomas Fairyblossom, a young artist buys him as a birthday present for his niece Violet who lives in Bombay, India. The yourney brings Reginald to towns such as Salzburg, Vienna, Prague and Triest all the way to Bombay. Later Violet takes him back to London with her, where after her death he passed to Richard, the son of the chauffeur. Richard takes Reginald with him to a Catholic Convent in Bommont in Provence. Reginald travels by the side of an other young man all the way to America and there he becomes the lucky mascot of the opera singer Gino Valetti. Following Gino’s tragic death Reginald goes on to have many more adventures in Egypt and manages to end up back in London towards the end of the Second World War. Having survived a bomb attack he then spends many years with Detective superintendent Söderström. After he dies Reginald sits in attic of Söderströms Villa in Berlin, simply waiting to be found. Reginald´s best friend is Shari, a, ancient Spirit of the air, with whom he shares many an adventure. Dorothea Bartels bought Reginald complete with a suitcase full of old photographs.